Bridal Guide is a publication for brides and engaged couples that provides all the information needed to plan a beautiful and memorable wedding. 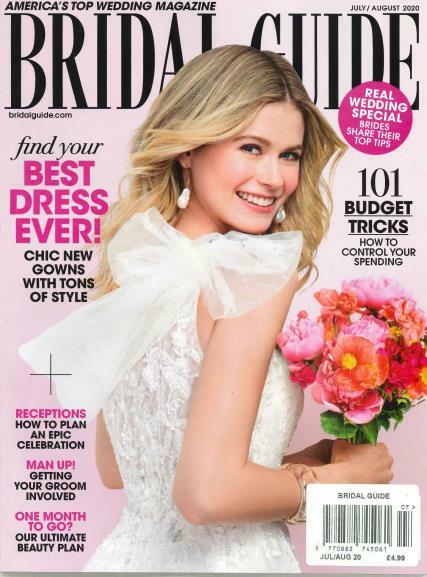 Buy a single copy or subscription to Bridal Guide magazine. This is your source of information on everything having to do with weddings. There is a wide selection of gowns to feast your eyes on, information on planning your wedding including engagement parties, the ring, deciding on a wedding budget, the showers and parties, selecting your invitation and thank you cards, planning the ceremony, choosing the flowers, the cake, and wedding venue. You will also find information on honeymoons, reception décor, married life, makeup and hair tips for the big day, wedding etiquette, and picking the right songs for the wedding ceremony and the reception. A few of the signs include talking about nothing but the wedding, you are doing research all the time about the wedding but not making any progress, you are so detail focused that you are worrying about the weather report for the country that your flowers are coming from, you are threatening your friends if they choose similar color palettes as yours for their wedding, or you are calling your wedding planner twenty times a day.